Muhammad (Arbii: محمد April 20 571 - June 8 632 AD) ek Arabian religious aur political leader rahae jiske Muslim log Allah (God) ke aakhri prophet maane hae. Uu Ishmael, Abraham ke larrka ke larrka rahaa. Adil Salahi (2002). 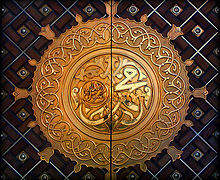 Muhammad: Man and Prophet. Islamic Foundation (UK). ISBN 1-86204-290-X. Berg, Herbert, ed. (2003). Method and Theory in the Study of Islamic Origins. E. J. Brill. ISBN 90-04-12602-3. Dashti, Ali (1994). Twenty-Three Years: A Study of the Prophetic Career of Mohammad. Mazda. ISBN 1-56859-029-6. Rodinson, Maxime (1961). Muhammad. New Publishers. ISBN 1-56584-752-0. Warraq, Ibn (2000). The Quest for the Historical Muhammad. Prometheus Books. ISBN 1-57392-787-2. ↑ "Muhammad". Encyclopedia Britannica. Retrieved 2008-07-18. Ii panna ke 28 January 2018, ke 15:43 baje, pichhla time badla gais rahaa.